COL Erasmus M. Weaver, Jr. 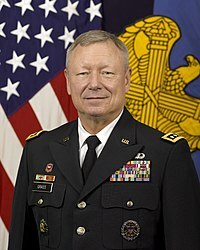 The Chief of the National Guard Bureau (CNGB) is the head of the National Guard Bureau, which is a joint activity of the Department of Defense, and is a member of the Joint Chiefs of Staff. The Chief of the National Guard Bureau is the highest-ranking officer in the National Guard of the United States; which is a joint reserve component of the United States Army and the United States Air Force. The CNGB serves as the principal advisor to the Secretary of Defense, through the Chairman of the Joint Chiefs of Staff, on matters involving non-federalized National Guard forces and on other matters as determined by the Secretary of Defense. The CNGB also serves as the principal adviser to the Secretary of the Army, Secretary of the Air Force, the Chief of Staff of the Army, and the Chief of Staff of the Air Force, on matters relating to federalized forces of the National Guard of the United States and its subcomponents; the Army National Guard of the United States, and the Air National Guard of the United States. The CNGB is a federally recognized commissioned officer who has served at least 10 years of federally recognized active duty in any of the Reserves of the Army or Air Force. The CNGB is nominated for appointment by the President from any eligible National Guard officers holding the rank of major general or above, who also meets the requirements for the position as determined by defense secretary and the chairman of the Joint Chiefs of Staff, under the advice and/or recommendation from their respective state governors and their service secretary. The nominee must be confirmed via majority vote from the Senate. The CNBG serves a four-year term of office at the pleasure of the President. By statute, the CNGB is appointed as a four-star general serving in the reserve active duty of the Army or Air Force. The current CNGB is General Frank J. Grass, USA. ↑  SEC. 1812. ESTABLISHMENT OF NATIONAL GUARD BUREAU AS JOINT ACTIVITY OF THE DEPARTMENT OF DEFENSE. ↑  10 USC 10502 Chief of the National Guard Bureau: appointment; adviser on National Guard matters; grade; succession. ↑ Either from the United States Army Reserve, the Army National Guard of the United States, the United States Air Force Reserve or the Air National Guard of the United States.